Flight Data Analyzer is a software program used to download and analyze the flight data recorded by either the transmitter or the receiver. 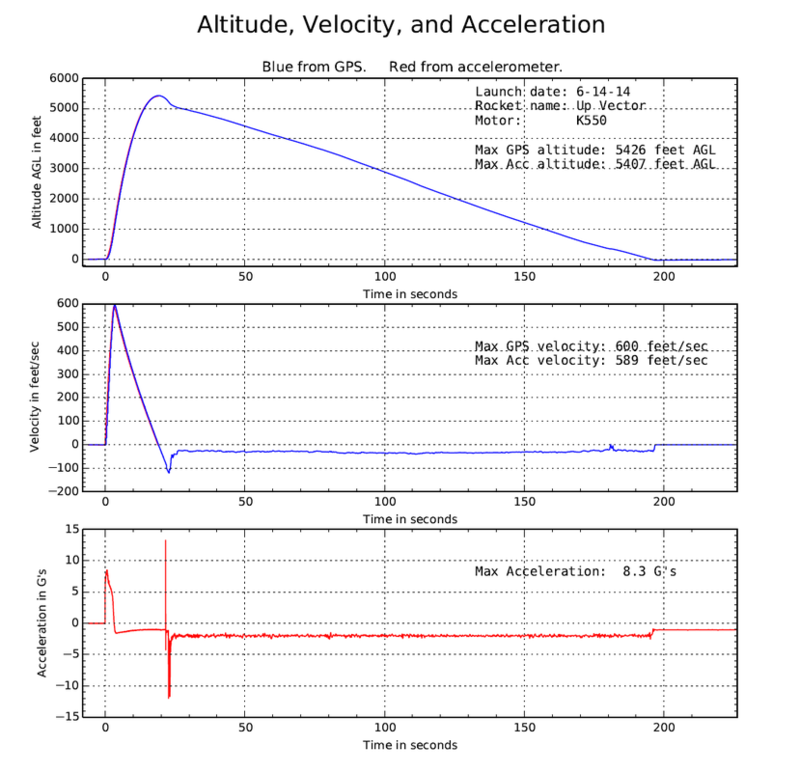 The data is presented in various plots and as a Google Earth trajectory. An Excel spreadsheet is also created to allow the user to perform any further analysis that might be needed. It can also replay the Kate audio. An example flight is included as a "demo" for anyone wishing to test drive this software. To run the demo go to the File menu and open the file for the flight of "Dark Energy" on an N2200. Flight Data Analyzer (Rev 3.2) Only windows is supported at this time. Version 3.2 is the latest version. It now includes a graph of the tilt angle from vertical during the boost phase. It also supports altitudes higher than 524,000 feet. More details about version 3.2 can be found here. The installation process for this software does not make any changes to the Windows system or to the registry. It simply creates a folder named "TelemetryPro" in your "Documents" directory. It also puts a shortcut to the program on your desktop. To uninstall the program just delete the TelemetryPro folder and the shortcut. Previous versions of this software along with the change history log can be found here. Flight Data Analyzer automatically generates a flight trajectory that can be viewed in Google Earth. This image shows a two-stage flight made at Lucerne Dry Lake in California. The motor burn for each stage is shown in red. Blue indicates coasting. Yellow shows descent on drogue parachute and green is on the main parachute. Click on the image for a closer look. 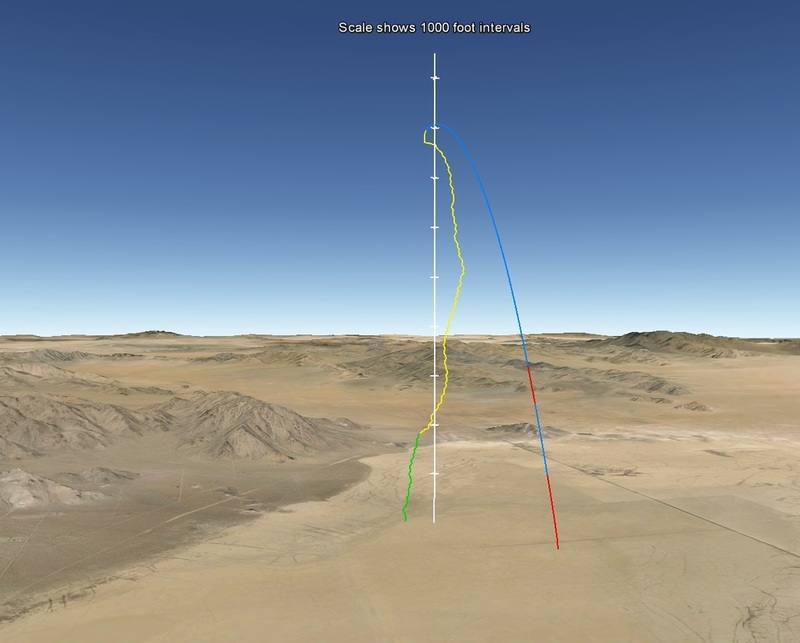 Download the Google Earth file and you will be able to view the trajectory from any angle. It gives a very good virtual 3D view of the flight. 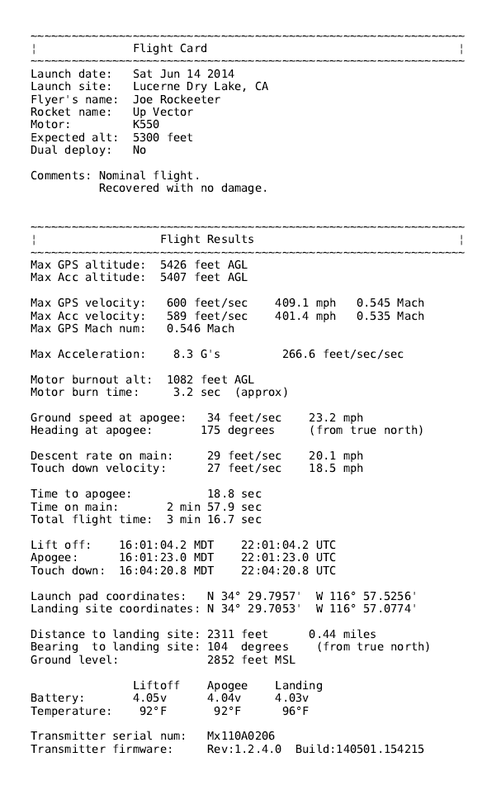 Flight Data Analyzer also generates a flight summary report in PDF format. The report contains a summary page of all the key data and then seven pages of plots. You can view an example using this download button. 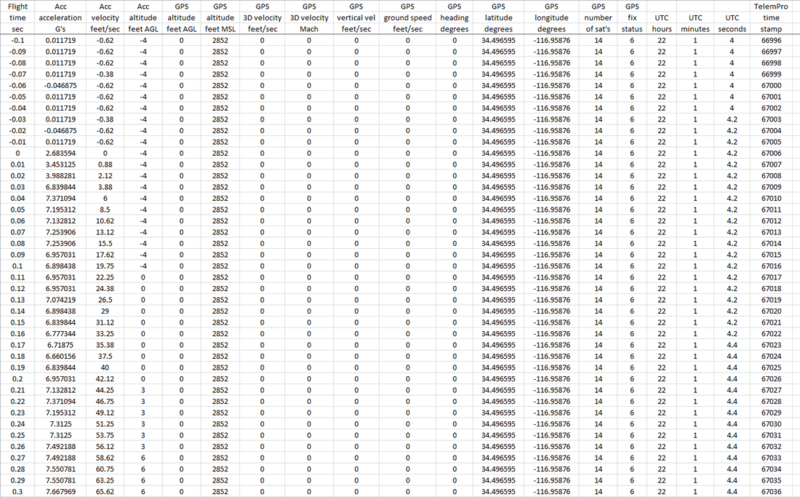 Flight Data Analyzer automatically generates a spreadsheet with all the data in CSV format. This can be opened in Excel or most any other spreadsheet program. It allows the user to perform whatever additional analysis is desired. Including creating custom plots.